Wolves will stay in their own territory so long as there is enough food. The core part of their territory that they spend half of their time in averaging about 35 km² (14 sq miles). When their pups start to grow, they are constantly on the move looking for more food, and will often widen their territory. As wolves are highly territorial, they will defend their territory if other packs try to come into the area and attack the other pack, if necessary. They mark their territory with urine and feces every couple hundred meters to let other wolves know the boundaries. They also use howling and ground scratching as a way of letting others know the territory is already taken. Their fine sense of scent is often used to locate prey, though they may also use tracking or react to chance encounters. When hunting, wolves will not sneak up on their prey, nor will they single out an animal until the herd begins running. This approach strategy is used only by cursorial predators and differs greatly from that of other large predators such as lions or cougars. Whether they are targeting a lone individual or a herd - getting as close as possible is very important, in order to shorten the chase. Then once the prey is aware of them, the prey is left with two choices: to run or stand their ground. Larger animals, like elk and moose, usually stand their ground, and the wolves have little chance of bringing the animal down. But if the prey decides to run, the wolf pack follow in hot pursuit, eventually tiring the animal. 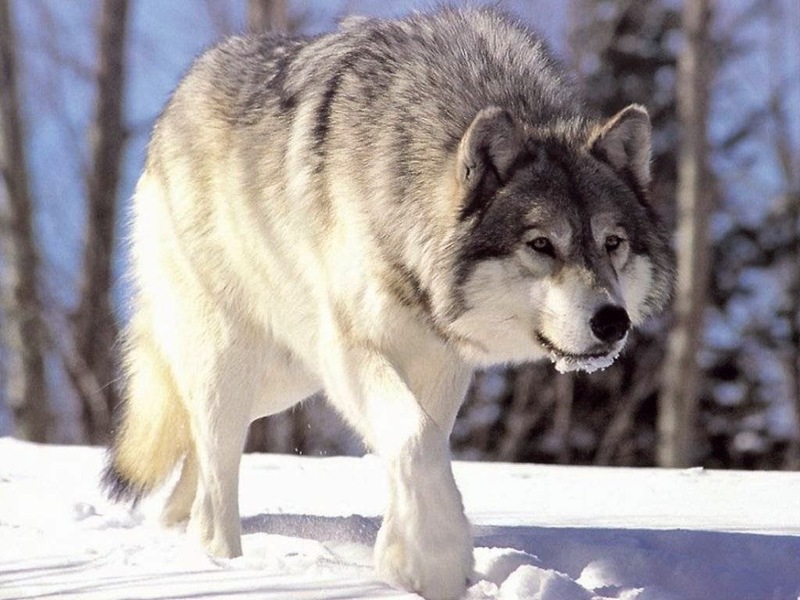 Wolves will usually chase an animal for 1 to 2 km, but longer chases have been known. If the prey animal is part of a herd, the wolves will try to chase it away from the main body to isolate it and bring it down. Not all wolves hunt in packs, hence the term, lone wolf. 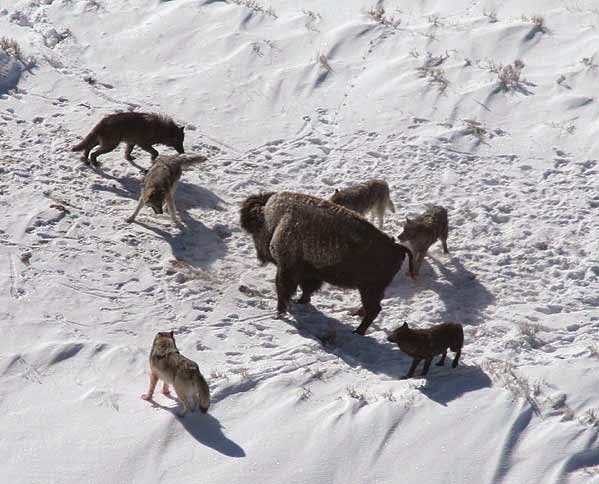 Mated wolves may also hunt as a team. Both lone wolf and mated pairs sometimes have better luck at hunting than the pack does. They have been known to take down animals as large as muskox and moose. Wolves are social animals. Like us humans they usually live in nuclear families, which often consist of a pair of adults, their yearling and juvenile offspring. The average pack size often being as small as 5-11 animals. Sometimes two or three of such families stick together and in rare occasions pack sizes of up to 42 animals have been known. The gray wolf is monogamous, with mated pairs usually remaining together for life, unless one of the pair dies. If there is an abundance of food this adult pair ideally produces 4 to 7 pups every year. The newborn pups are born unable to see or to hear at first and stay inside the safe den for the first 4 weeks of their lives. Pups often face a high mortality rate of up to 60%, starvation generally being the main cause. If they live to reach the age of 1 or 2 the young wolf can then decide to stay with the pack or to leave it and look for it's own territory. New packs in general are founded by unrelated male and female wolves that have left their old pack and start travelling together in search of their own territory away from other hostile packs. While it is rare that a pack adopts another wolf into their family and more likely that the pack will kill it, it can happen if the adopted wolf is an immature one that is not likely to compete for breeding rights with the adult pair. 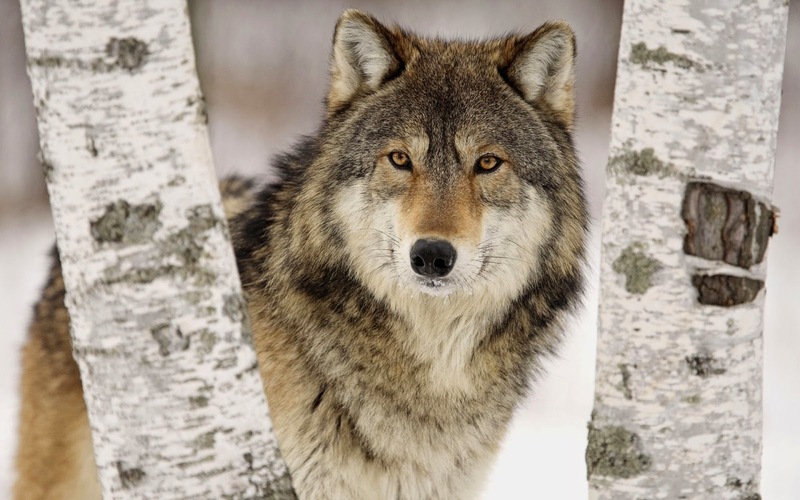 Sometimes another wolf will be accepted into the pack to replace a deceased breeder. The main form of communication between wolves is through body language, such as eye contacts, facial expressions, posture and tail position. Sounds, like whimpers, whines, barks and howls as well as scents are other means of communication within their pack or with other wolves in their territory. Howling for example is mainly used to assemble the pack, to pass on an alarm or to locate each other in unfamiliar territory, over long distances or during a storm. Their howls can be heard as far as 130km away in good conditions. While pups never howl, yearlings can be distinguished from older animals through their series of dog-like yelps. The older the wolf the deeper his howl will sound. Scent markings, like urination, defecation and ground scratchings are used to mark their territory and can be found throughout the territory at a distance of about 240m. Markers are placed near rocks, boulders, trees or big skeletons along the way of regular travelpaths and junctions. Within the pack it can come to physical conflicts when the hierarchial relationship needs to be reinforced. 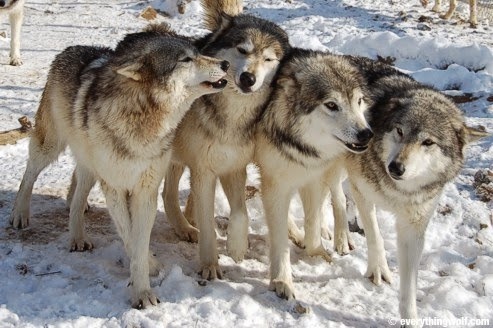 But in general wolves try to not injure members of their own pack. It is more common to see a cordial behavior, like bringing food to debilitated pack members. Even the way they behave towards dead pack members suggests a state of mourning and shows their social and amiable side. One of amazing animals that can be found in the South Chilcotin Mountains and around our working ranch is the Gray Wolf, a beautiful but very elusive animal. To hear it's howl in a moonlit night might send shivers down your spine, but it also gives this special feeling of an old wise and quite magical being. To honor these mystical beings, and because you can see them in our wildlife trips, we decided to do an educational series about them. The gray wolf (Canis lupus) also known by the names timber wolf or western wolf is an often misunderstood and feared animal. What is not known is that wolves will rarely attack humans, indeed they've been taught the opposite by hunters over time: to stay as far away as possible from humans and to fear them. Most of the attacks that have been recorded were caused by wolves who suffered from rabies. 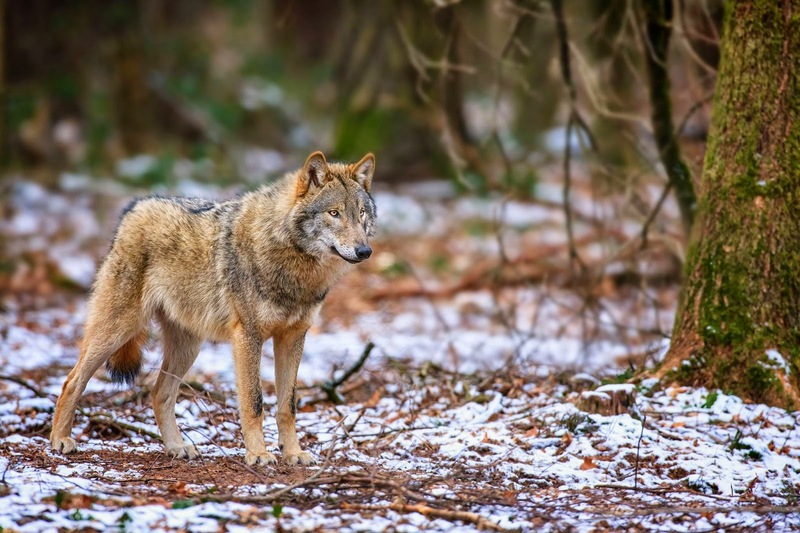 While the gray wolf is native to North America where it predominately can be found in Alaska and Canada, wolves are also home in other parts of the world, like Europe and Asia. Some mythologies in Northern Europe and Asia pay the wolves high respect and even portray them as near deities. Japanese farmers, for example, would leave food offerings near their dens to seek protection of their crops from deer or bears. They are majestic creatures, especially in winter when their fur is long, bushy and very dense. The fur usually has an unevenly spotted grey color, but can take on an almost pure white, red, brown or black tone. Their thick coats make them highly resistant to the cold and even with temperatures dropping as low as -40° a wolf can rest comfortably in open areas by placing their muzzles between their rear legs and using their tail to cover their face. Compared to dog fur the wolf's fur provides a much better insulation. In spring most of the short underfur will be shed and grow back in fall. White hairs at the tip of the tail, along the nose or on their forehead usually means that it is an older wolf. Their lifespan can vary a lot. While the usual age they reach is between 6 and 8 years, examplaries who reached the age of 13 (wild) or 17 (in captivity) have been recorded.